Ezekiel Smith and his large family had settled, in about 1806, in the area which is now the intersection of Abbott and Newton Roads within what was then the original, larger Town of Hamburg. The family established a series of grist mills on local creeks, with the last mill being on Eighteenmile Creek just west of the present South Buffalo Street bridge in the Village of Hamburg. (Later owners of this mill were named Long, Riest, Bastian and Schoepflin.) 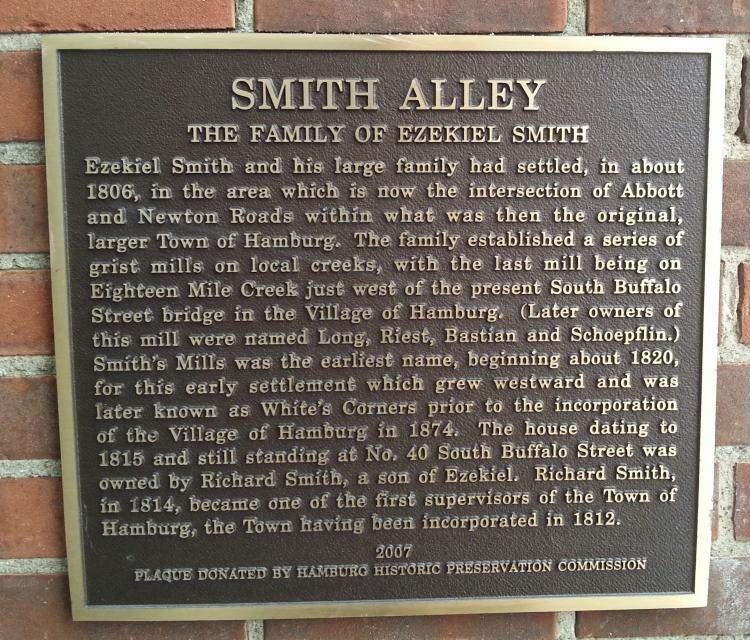 Smith's Mills was the earliest name, beginning about 1820, for this early settlement which grew westward and was later known as White's Corners prior to the incorporation of the Village of Hamburg in 1874. The house dating to 1815 and still standing at No. 40 South Buffalo Street was owned by Richard Smith, a son of Ezekiel. Richard Smith, in 1814, became one of the first supervisors of the Town of Hamburg, the Town having been incorporated in 1812. Attached to the wall of the Alley. This marker can also be identified by its HM code. You can use the hashtag #HM1K16 in tweets, and any other place where you might refer to this marker, including when searching on this site.